Wind Point Public Works strives to remove snow and ice in an expeditious and orderly manner. During a storm, main streets receive priority and are salted and/or plowed first. Residential streets are started after, and maintained in conjunction with, the main streets. As salt inventory permits, salt is applied to these streets at each intersection and on hills and curves. Plowing is provided to keep these streets passable to normal vehicular traffic. After snow and ice has been removed from streets, Wind Point Public Works plows snow on the paths at Village Green and other certain paths in Wind Point. Residents are responsible for clearing snow around fire hydrants that are adjacent to their property. 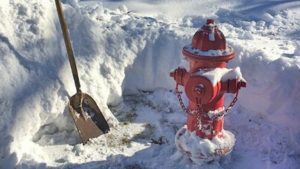 If a fire hydrant is lost or buried in the snow, firefighters can lose valuable time trying to locate and dig out the hydrant when they arrive. Clear the snow three feet all around the hydrant so firefighters have enough room to connect a hose. It is the responsibility of the property owner to replace a mailbox damaged by snow that was pushed by the plows. Make sure your mailbox is winter-ready by ensuring it is straight, sturdy and stable and meets US Postal Service installation and maintenance requirements: 41 to 45 inches off the ground, 6 to 8 inches back from the curb or edge of the pavement, buried 24 inches in the ground and able to safely break away if struck by a vehicle.